The EU Referendum – The end of the Labour Party or the United Kingdom? 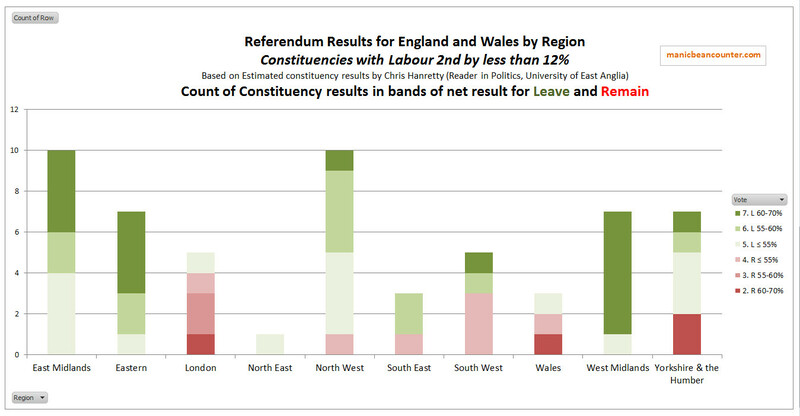 In the previous post I used Chris Hanretty’s estimated the referendum vote split for the 574 parliamentary constituencies in England and Wales to look at the pattern of voting. 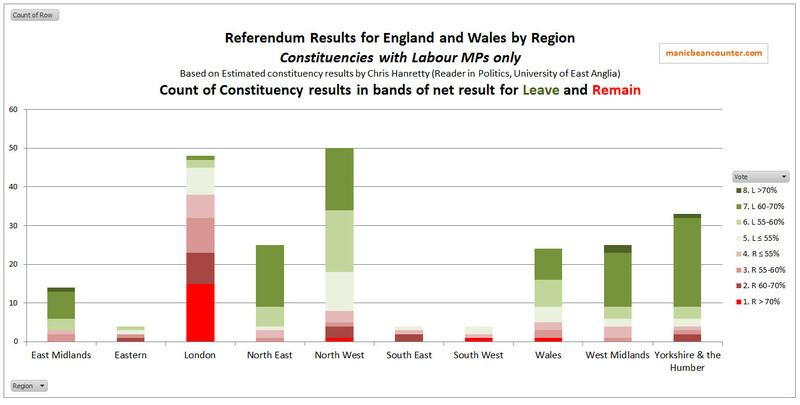 In particular I found that a disproportionate number of the constituencies with strong votes either for remaining in the EU or leaving the EU have a Labour Party MP. 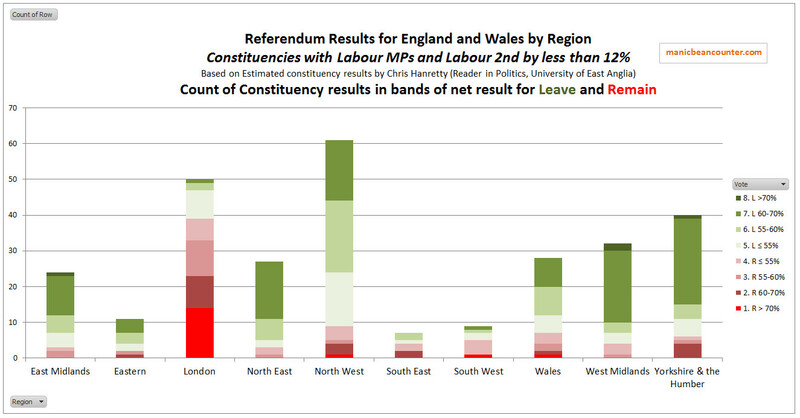 The graphic below shows the split by region for constituencies with Labour MPs. The strongest Remain votes are concentrated in London, whilst the majority of constituencies voted for Leave. This is not the full picture. Most of the Labour Party MPs still have a desire to become the party of Government. At a minimum, they would have to win enough seats to become the largest party to have a chance of power. Of the 573 parliamentary seats in England and Wales Labour came second in 212. Of these, 58 had majorities of less than 12% of the popular vote. This would mean winning 56 from the Conservatives and 2 from the Liberal Democrats. The problem for Labour is that these target constituencies exhibit similar patterns to the existing Labour constituencies. That is, there was support for Remain in London, and support for Leave in much of the rest of the country. The differences between existing and target Labour seats are slight. The proportion of seats that voted Leave is slightly higher (78% against 69%), whilst the constituencies that voted at least 60% Leave is lower (29% against 39%) when compared to existing Labour constituencies. Adding these target seats to the existing seats makes very little difference to the split between London and the rest of England and Wales, except for downgrading the relative importance of London in relation to the Midlands and the North West of England. The elephant in the room is Scotland, where Labour lost 40 seats to the SNP. It is likely that every single one of these voted to Remain in the EU. This compares to just 8 Labour losses in England and Wales, everyone to the Conservatives and 7 calculated by Chris Hanretty to have voted for Leave. To make themselves electable in Scotland and maintain support in London where up to 40% of the membership live, Labour must support some policy of opposing Brexit. But this would scupper their chances of winning more seats most of England and Wales, and might help maintain support for UKIP. This is particularly true in the North and Midlands where UKIP are strongest. This is illustrated in the table below. This gives the biggest issue of them all. If Labour manage to revive from their present turmoil and become the largest party at the next election, then the price of power might be the breakup of the United Kingdom. But this is unlikely to happen if in 2020 Brexit remains the over-riding political issue. If Brexit ceases to be an issue, Jeremy Corbyn, in hanging onto power might be doing the country a service by ensuring the breakup of the Labour Party into two unelectable factions.